I have a few 1930s-40s copies of London Life magazine, but I am still looking for Photo Bits, another pre-WWII fetishistic magazine. Debra Hyde has a few scans on Flickr. But when I came across a copy of a 1911 Photo Bits, our consistency really hit home. Here was an early 20th-century British relic that featured — what else! — items on corsetry, female impersonation, and extreme shoes, even headlining the latter as “the cult of the heel.” That’s very similar to the tamer sections of Willie’s Bizarre, isn’t it? 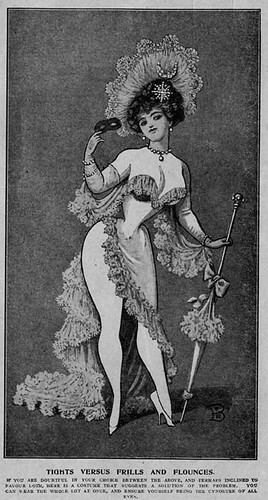 Photo Bits was considered an early girlie mag, a publication that tried to straddle the mores of the Victorian era even as the world move onward. The playful bathing beauties on its cover were eye-catching and tantalizing for its day and its headline about kleptomania almost yells “women inside!” Still, if not for the fact that Photo Bits makes an appearance in Leopold Bloom’s thoughts in James Joyce’s Ulysses, I’d be hard pressed to think of the publication as edgy. But there you have it.